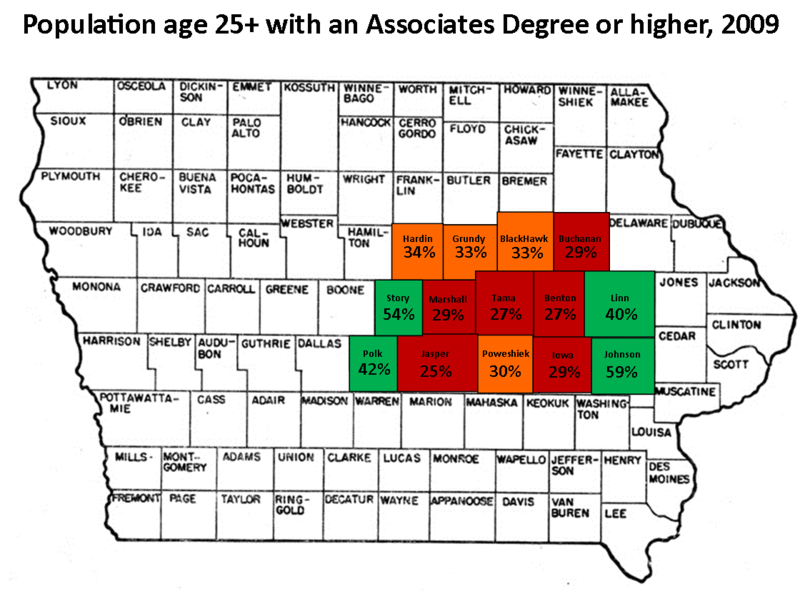 You are here: Home » Quarterly Newsletter: How is the demand on workers’ skills changing in Tama County, Iowa? In the decade ending 2018 there will be 47 million job openings. Nearly half will require an associate’s degree. The Georgetown Center on Education and the Workforce. One year ago Tama County employers emerging from the recession spoke up and articulated their need for skilled workers. They were very clear on the necessary skills that are needed. 1) certified nurses and nurses assistants, 2) certified truck drivers, 3) certified welders. The media coverage in our 1.2 million population trade zone was spectacular and local employers who struggled to find viable candidates reported a record number of applications of city folk applying to jobs in our rural small towns. But where was the gap? At the time 540 Tama County residents reported that they were looking for jobs. The shift we are seeing is in moving away from low-wage, low-skill industries and increasing need for workers with trade skills that can be obtained at a community college less than an hour away within two years. If you would like to receive the quarterly Tama County News Update directly to your email or mail box please email joanne@tamacountyiowa.org or call (641) 484-3108. For weekly updates subscribe to our blog or connect on facebook and/or twitter.